Holy smokes, there aren't many cards that you show that I actually have. Here's one of them. How do you know it's from 1975? I got the whole set, but it was much later than 1975. (Probably around 1980 or 81). I suppose they could have used the same photos over and over each year. I use the number prefix in the stamp square. 1975 starts with KV78 and KV88 is 1976. What prefix appears on your Russell card? Cool, sounds like a 1975 postcard to me! Starting from 1973, here's the prefix breakdown I've seen. Hmm. 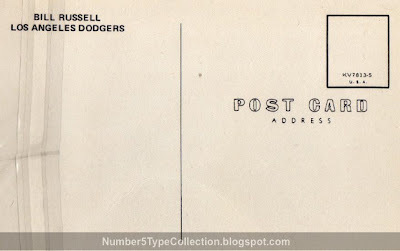 When someone ordered a team set, the Dodgers must've mixed older postcards with newer ones, because I checked the numbers on the back from my set, and according to your breakdown, some are from '75, some from '77, some from '79, etc. 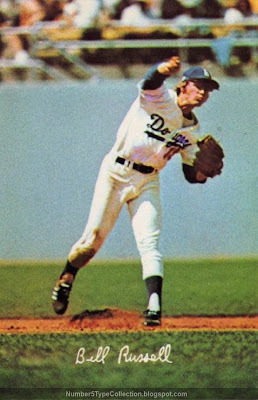 I have a Valenzuela one, which only has D-10 listed on the back. That must be from '81 or so.